Egyptian President meets Jewish leaders, expresses guarded optimism about peace between Arabs and Israel. Egyptian President Abdel Fattah Al-Sisi expressed guarded optimism about peace between Arabs and Israel, but also warned of the threat posed by Islamists, in a meeting with U.S. foreign policy experts that included Jewish organizational officials, JTA reports Thursday. The meeting took place on Wednesday morning at the Four Seasons hotel in Washington, D.C., with an array of some 65 guests, including representatives of think tanks that focus on the Middle East, informal advisers to President Donald Trump and representatives of an array of Jewish groups, according to the news agency. “He said the atmosphere is more primed now for peace than it was 40 years ago when Sadat made peace,” said Ezra Friedlander, the CEO of a consulting firm who is garnering support in Congress for Anwar Sadat, the Egyptian leader who in 1979 signed the first peace accord with Israel, to receive the Congressional Gold Medal. Another attendee who asked not to be named said Sisi praised Trump, with whom he met earlier in the week, for seeking to revive Israeli-Palestinian Arabpeace negotiations, but cautioned against rushing the talks. Trump has made Middle East peacemaking a priority, meeting at the White House in February with Prime Minister Binyamin Netanyahu and this week with both Sisi and King Abdullah of Jordan. “I’m working very, very hard on trying to finally create peace between the Palestinians and Israel, and I think we’ll be successful,” Trump told the Jordanian King at their meeting Wednesday. Later this month, Trump is due to meet with Palestinian Authority chairman Mahmoud Abbas. Sisi at the meeting with the Jewish leaders also called for a bid to roll back Iranian influence in the region, but cautioned against elevating tensions with the Islamic Republic to a military conflict, saying that would be disastrous. His overall emphasis was on confronting Islamist terrorists in the region, in particular groups like the Islamic State (ISIS), which has established a foothold in the Sinai, and he praised Trump’s renewed emphasis on combating the phenomenon. 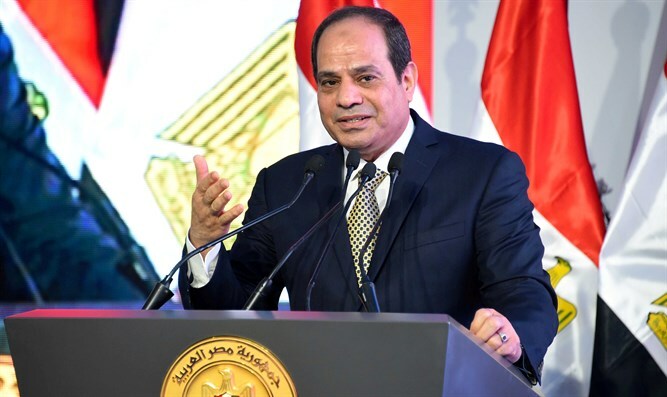 Jason Isaacson, the American Jewish Committee’s director of international affairs, who was present at the Wednesday breakfast meeting, said Sisi is focused on preserving ties with a critical ally. “President Sisi’s pursuit of closer alignment with the United States and his commitment to robust strategic cooperation with Israel are matters of record – and were key themes of his visit to Washington,” Isaacson told JTA. The Egyptian President has several times met with Jewish leaders in recent months. Ahead of his visit to Washington, Sisi met with the head of the World Jewish Congress, Ronald Lauder, in Cairo. Sisi's spokesman said at the time that the meeting reflects Egypt’s keenness on communicating with all parts of American society on boosting bilateral understanding of the current challenges faced by the region. A year ago, Sisi met with the leaders of the Conference of Presidents of Major American Jewish Organizations in Cairo.